The Internet is the best resource for sharing your artwork. It’s never been so easy to build a following around your work and make a name for yourself in the art world. Only problem is finding the right websites to use, DeviantArt being the most popular and oldest since its launch in August of 2000. Although you can find find plenty of similar sites like DeviantArt with even better sharing features and more focused communities. This is my list of the best alternatives to DeviantArt that all offer the same supportive community for artists. 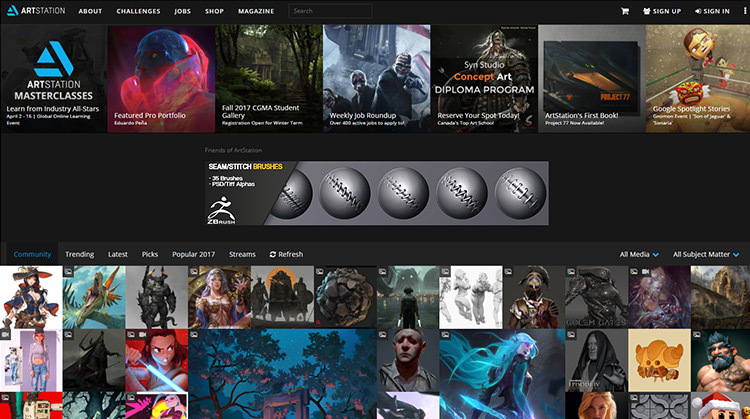 No doubt the fastest-growing digital art community on the web is ArtStation. This website is a true haven for illustrators, concept artists, and animation artists with the best profile interface I’ve ever seen. You can build an entire portfolio right on their site organized by categories or projects. Not to mention they have an entire “bio” section where you can add links to your social accounts and your personal website. ArtStation is truly about the art which should be apparent right from the homepage. You can browse through all the latest works in their community and sort by different projects or media types(2D or 3D work). 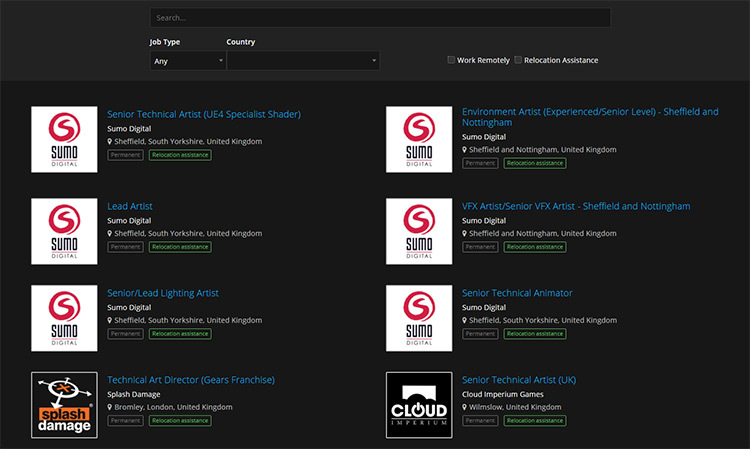 And one of the coolest new features is the ArtStation job board where artists can find freelance or full-time jobs in many fields. This is something DeviantArt really lacks so it’s one reason I generally consider ArtStation a more “grown-up” professional version of DA. The majority of work published to ArtStation is digital and related to entertainment artwork like characters, creatures, environments, storyboards, or thumbnail sketches. A traditional artist can still join and publish work. The community is great and you’ll likely get plenty of feedback. But I do feel that the community skews more towards digital 2D & 3D works so it’s mostly a site to publish your finished pieces and build an online portfolio. Another fantastic DeviantArt alternative is CGSociety. This site is totally free just like ArtStation and even has a similar feel to the ArtStation design. 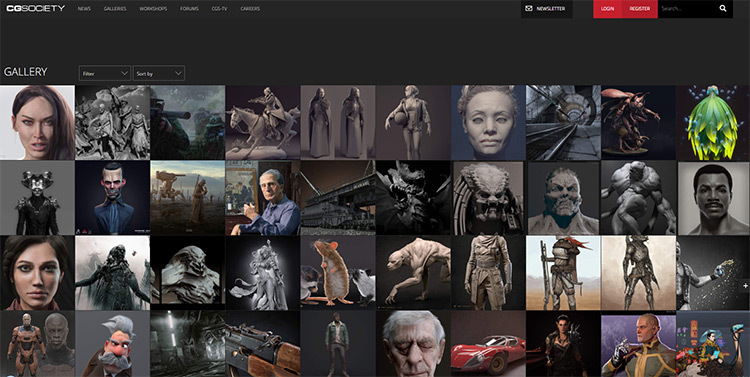 If you visit the galleries page you can browse through all the latest posts from artists on CGSociety. You’ll notice most of these are 3D renders, models, or wireframes of characters/creatures. That is probably the biggest difference with CGS vs ArtStation. With the CGSociety community you’ll get a lot more 3D artwork compared to 2D paintings. There is a decent mix of both if you look hard enough. I just notice it slants more towards 3D. Which is great! 3D modeling is a growing field with plenty of opportunity in game design and animation. But there’s one big aspect of CGS that I really recommend checking out: the CGTalk Forums. Their forums follow a typical BB-style layout where posts are threaded and archived over time. This way you can easily read through older replies and gather advice from other artists. Forums offer more space for critique than just comments on a post, so that’s one reason I like this setup over the current DeviantArt comments section. It’s also a bit more active than other art forums. If you’re looking for another site to share your digital artwork then definitely join CGSociety. It’s totally free and growing fast. 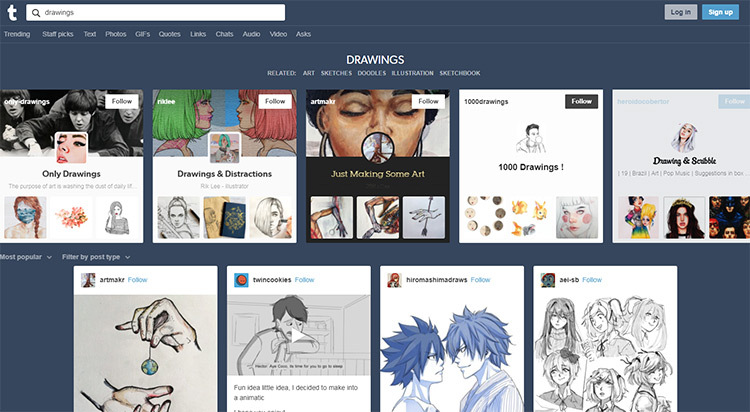 If you want a site kinda like DeviantArt but with more variety then Drawcrowd is fantastic. This is designed like ArtStation but it doesn’t have a specific focus on digital or traditional. It’s really a balanced community of both styles with so many artists at varying skill levels. You can use Drawcrowd as a way to share your progress from complete noob to pro, or use this as a portfolio for your polished work. Or maybe a mix of both. Drawcrowd has all the social features you’d expect like artist profiles, follower counts, photo “likes” and reshare buttons too. But one reason Drawcrowd stands out is because of its more laid-back social environment. I see ArtStation as more of an online portfolio that you’d want to keep clean and tidy for job opportunities. I see Drawcrowd more like Instagram or Twitter where you can post any of your works to share with friends, followers, and your fanbase. Pics can range from simple studies to more abstract personal projects. 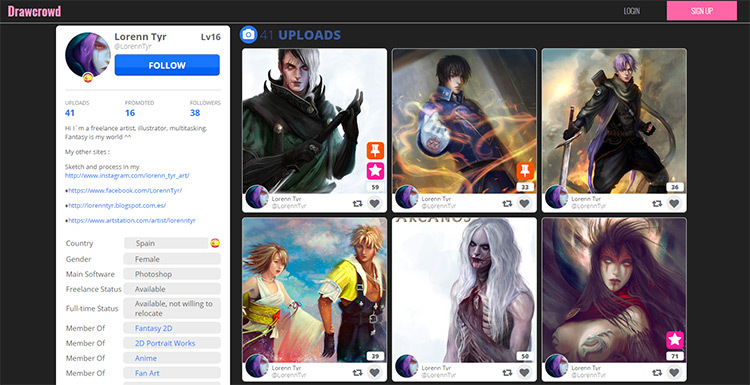 Really, anyone who’s looking for a site just like DeviantArt will be thrilled with Drawcrowd. Only trouble is the site’s pretty new and doesn’t have the largest userbase. Yet with all these features I think it’s growing fast and it’s likely to be around for years to come. You can keep up on site news from the official forums and sign up for a free account on the homepage. I wasn’t sure whether to include Pixiv because it’s really not designed for English-speaking audiences. But this site has grown so fast over the past 8-10 years that it simply cannot be ignored. Pixiv is an online illustration & art community created in Shibuya, Tokyo back in 2007. It was relatively unknown to the western world until somewhere around the early 2010s… or at least that’s when I found it! The goal of Pixiv is much like DeviantArt: share your artwork, get feedback, and build a following on your profile. It also has a star rating system where users can rate your works and you can sort by the highest rated illustrations in any category. Same with sorting by tags which Pixiv uses to offer recommended artists as you browse. You can make an account for free and you’ll find so many cool features once you’re inside. 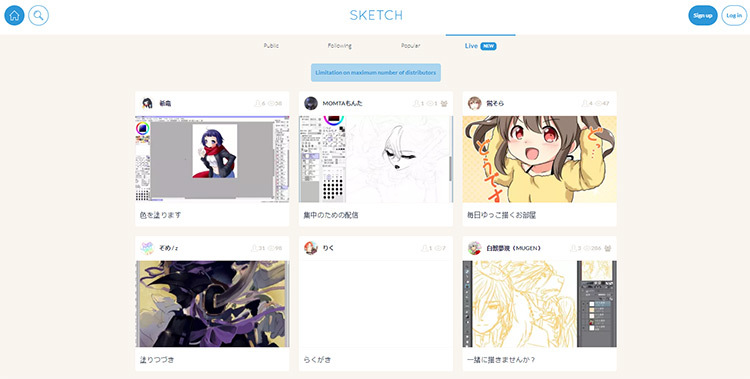 They even have a live drawing tool where artists can stream art sessions live right through Pixiv. Basically Twitch for artists. And users who create multi-image manga-style comic books can submit galleries as single posts. This way people can read your mangas or comics page-by-page all from the same gallery. You can even design your own manga and publish the whole thing on here. Pixiv was built for a Japanese audience. While you can change the website’s default language to English, most of the userbase is Japanese. That means you won’t get many comments in English or find many other users with English names. In fact many of the artwork tags use Japanese characters(Hiragana/Katakana) so you’ll get totally different results if you search “zelda” vs ゼルダの伝説. 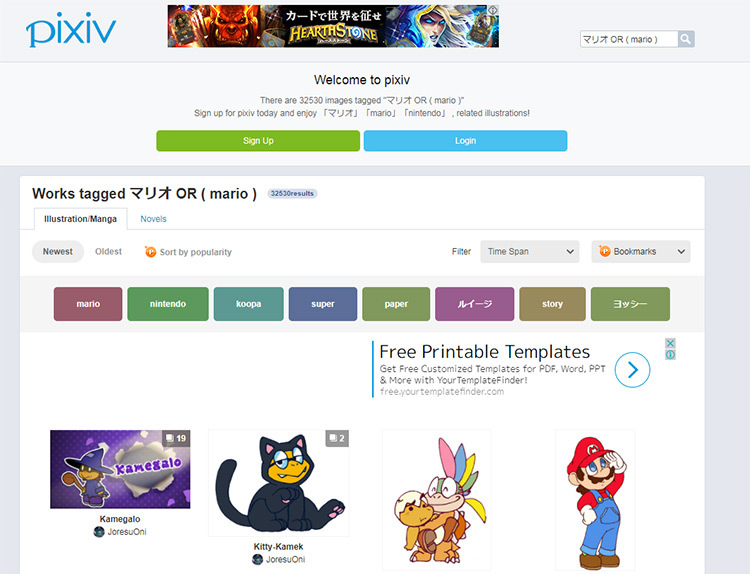 The team has worked hard to update the search to automatically recognize English and Japanese phrases for popular tags(for example “Mario“). But it’s far from perfect and the site clearly caters towards Japanese users. I do think it’s worth joining at least to browse and get some ideas if you love the anime art style. You can also publish work on there if you want, but you won’t get much feedback compared to ArtStation or Drawcrowd. I’ll admit that Behance is more of a digital design portfolio site rather than an art community. But it does offer a genuine alternative to DeviantArt, especially with their portfolio feature. DeviantArt does a great job of organizing projects, sketches, studies, and practice work into one place. However Behance just looks a bit “cleaner” and feels more professional to share. This makes it easier for prospective clients to browse through your work at a glance. Their comment system is also pretty simple and feels a lot like DeviantArt. But they don’t have threaded comments so it’s tougher to reply directly to people on there. One nice feature is that you can post galleries of artwork like this example from Stockholm artist Therese Larsson. This makes it super easy for artists to share entire projects cataloging their work from start to finish. From basic sketches all the way to final pieces, you can organize everything into one post and share it all together on Behance. Anyone can sign up for free and start posting right away, no hassle and no BS. It’s one of the more lenient sites out there with a very large userbase. It can be easy to get lost in the noise so you’ll need to do a lot of self-promotion to build up your following. But even aside from the mix of design work and digital media there’s plenty of room for artists to make a name for themselves in this community. 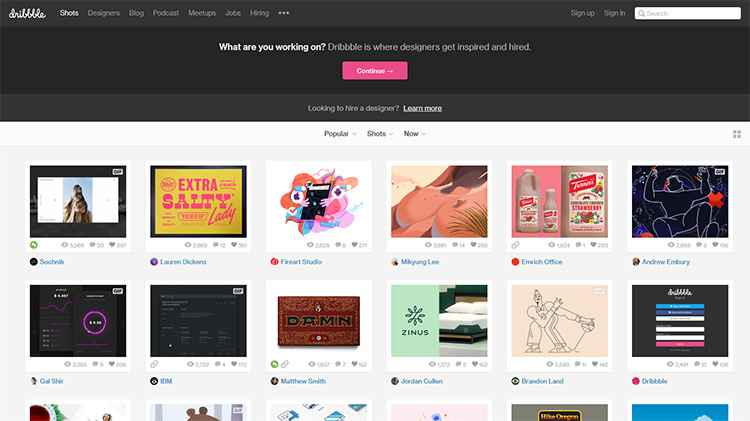 Dribbble is much like Behance except it’s an invite-only website. The goal of private invites is to keep the quality high. This started as a design-only community where UI/UX designers would invite their friends, then they’d hand out invites and it would grow from there. Nowadays it’s not too difficult to get an invite since there are so many people on the site. But if you’re an artist you may not bother joining since it’s primarily a designer’s community. I still wanted to include this here because there are some truly talented artists in Dribbble. 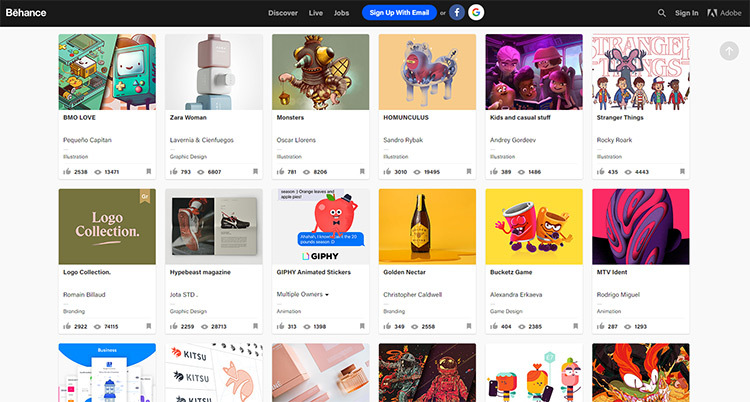 They are few & far between compared to all the designers but I think Dribbble would do well to invite more artists into the mix. One of my favorites is Rogie King who publishes a lot of his own illustrations. He’s a designer/artist hybrid so you’ll find a lot of mixed work on his profile. But you can also search through the site for keywords like painting or character design to see what you can find. And the best thing about Dribbble is the potential for client work. People know Dribbble accumulates great talent. Many agencies and creative teams look there when hiring a freelancer for a project. There may not be as much demand for illustrators on Dribbble compared to ArtStation or DeviantArt. But it’s one more site you can use to showcase your work and build your online presence. I’m hesitant to recommend Tumblr since it’s not a fully-focused DeviantArt alternative. This is primarily a blogging network so there’s no specific “art” section of Tumblr. You’ll need to go out of your way to build up a following for your Tumblr page and use it strictly for your artwork. With that said, many artists do use Tumblr to show off their art. The userbase is full of artists and full of people who love art; you just need to know where to find them. The downside? Not much room for critiques, commentaries, or back & forth conversations. There are private messages but most people use Tumblr to reblog photos rather than leave comments for the creator. If you already have a Tumblr then you might understand its potential in promoting your work. If you don’t have one then I can’t say you’re missing out too much… especially considering all the great alternatives listed above. Still I think it deserves a spot in this list because it’s a website much like DeviantArt where you can share artwork, build a following, and create a profile to interact with the art community.